The Commodore 64, also known as the C64 or the CBM 64 or VIC-64 in Sweden, is an 8-bit home computer introduced in January 1982 by Commodore International (first shown at the Consumer Electronics Show, in Las Vegas, January 7–10. 1982). It is listed in the Guinness World Records as the highest-selling single computer model of all time, with independent estimates placing the number sold between 10 and 17 million units. Volume production started in early 1982, marketing in August for US$595 (equivalent to $1,477 in 2016). Preceded by the Commodore VIC-20 and Commodore PET, the C64 took its name from its 64 kilobytes (65,536 bytes) of RAM. It had superior sound and graphical specifications compared to other earlier systems such as the Apple II and Atari 800, with multi-color sprites and a more advanced sound processor. The C64 dominated the low-end computer market for most of the 1980s. For a substantial period (1983–1986), the C64 had between 30% and 40% share of the US market and two million units sold per year, outselling the IBM PC compatibles, Apple Inc. computers, and the Atari 8-bit family of computers. Sam Tramiel, a later Atari president and the son of Commodore's founder, said in a 1989 interview, "When I was at Commodore we were building 400,000 C64s a month for a couple of years." 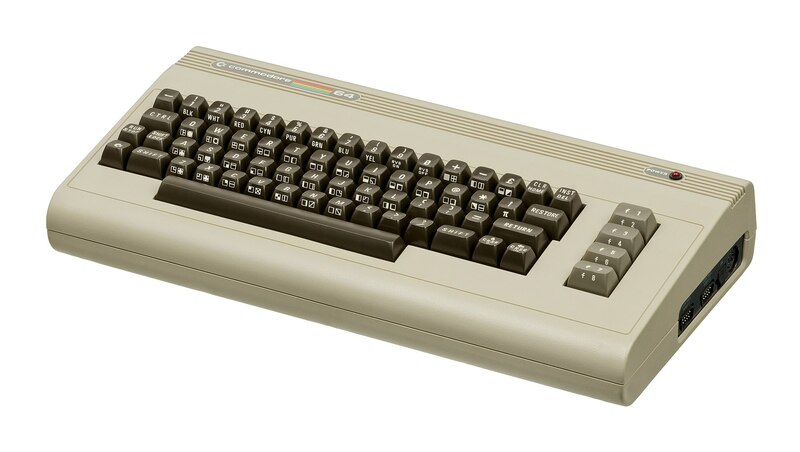 In the UK market, the C64 faced competition from the BBC Micro and the ZX Spectrum, but the C64 was still one of the two most popular computers in the UK. Part of the Commodore 64's success was its sale in regular retail stores instead of only electronics or computer hobbyist specialty stores. Commodore produced many of its parts in-house to control costs, including custom integrated circuit chips from MOS Technology. It has been compared to the Ford Model T automobile for its role in bringing a new technology to middle-class households via creative and affordable mass-production. Approximately 10,000 commercial software titles have been made for the Commodore 64 including development tools, office productivity applications, and video games. C64 emulators allow anyone with a modern computer, or a compatible video game console, to run these programs today. The C64 is also credited with popularizing the computer demoscene and is still used today by some computer hobbyists. In 2011, 17 years after it was taken off the market, research showed that brand recognition for the model was still at 87%. Commodore Formatted Floppy Disk Images, ROM Cartridge Images, or Tapes. This page was last modified on 14 October 2017, at 13:31.